Scuadra New Product : Color Reference Card New ! 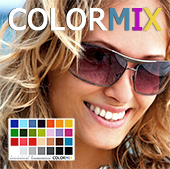 ColorMix is a color reference card composed of 28 colored RVB and CMJN patchs plus 7 neutral grey patchs. Each patch is individually mesured with a spectrophotometer et values are reported at the back of the card in L.a.b., AdobeRGB98, sRGB and ProPhoto spaces. These chromatic values are known. So they let check and adjust the color settings during the images post-production process. LightShield V2 hood is a professional solution to eliminate all light pollutions on the screen during post production. The TrueColors white balance card is a neutral grey used to get the good white white balance in all situations. The XpoGrey exposure card is the accessory of every photographer concerned with the best exposure of pictures. Complete color control and optimized printer profiling to match colors on your display with images that you print. Scanners always render faithfully colors when used with their own custom iCC profile. Get your own one. The quality of art prints available on high-end Scuadra printers for your most beautifull images.